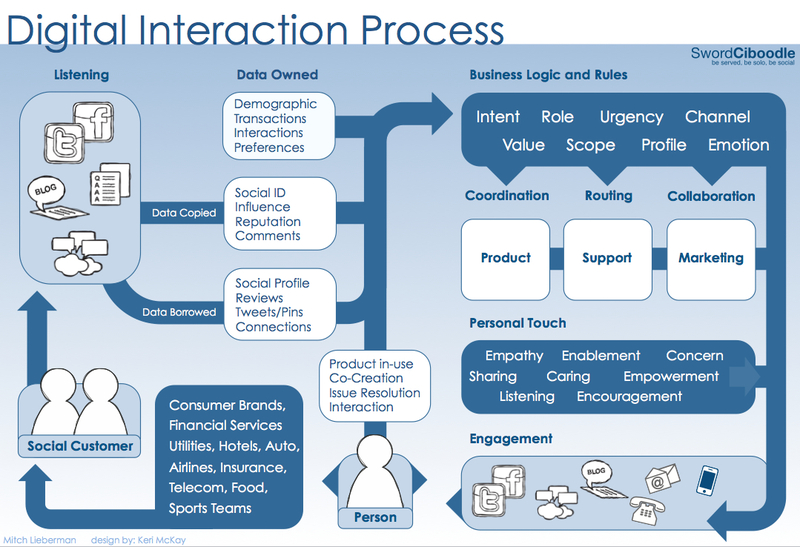 Is Social Process really Digital Interaction Process? You can run, hide, duck, turn, cover your eyes, plug your ears, maybe then you will have successfully avoided hearing, seeing or otherwise experiencing the Facebook IPO. I sometimes; no, quite often, wonder what the fascination is all about. What exactly has changed? What is really different? Is it that Everything simply happens faster. Yes that is one part, I suppose. I am not sure that is always good though. When presented with the opportunity to put our foot in our mouth, we see it as an opportunity not to be missed and take full advantage. We share (Tweet, Post, Email) without thinking, only now it is more permanent (Google never forgets). This raises the question, what role are these ‘social’ channels in customer service? The words we grew up with, now mean different things; Social, Engagement and Mobile, new context, new meaning. Think about it, when we were young(er) a ‘Social Engagement’ that was ‘Mobile’ could have easily meant a dinner party on a boat. A set of recent articles also suggests highlighting the importance of human social interactions to our well-being (HBR). Things do happen faster and some of it is social, some is just not – how can a company understand what is social, where does customer service really fit in, what is not and respond accordingly…at scale? I had the opportunity to co-present with Steven Thurlow, (our very smart CTO) to a small and engaged audience on Thursday. The topic was Social Customer Service. It was largely based on recent research done with thinkJar we shared the findings and went a little beyond as well. We took the opportunity to poll the audience, always wanting to learn. Guess what, the phone and email are still still ranked as the most important customer service channels. Surprised? I was not to be frank. Near the end of the presentation, I shared the diagram below and talked people through it. First, before I discuss it, I need to give credit where credit is due. My own thinking was (and is) influenced by conversations with Brian Vellmure and Esteban Kolsky. In my opinion social is a way of being and acting. According to many current discussions, one cannot be social be without digital (yeah, I know, not quite true). If I send a DM (Direct Message) on Twitter, is that social? If I message you on Facebook, is that social? Any more than an email, phone call or heaven forbid knocking on your door? Getting to the diagram; on the left is ‘Social’ and public, on the right is ‘Engaged’ and private (1 to 1, you and me). The influence that Brian had on this was to remind me that what everyone is calling ‘Social’ is really digital. Once the conversation is taken private (DM, SMS, Email, Kiosk) it is no longer ‘Social’, until one side or the other decides to bring it back into the public realm (vent, complaint, review, kudos). The influence Esteban had was that in a way, you could overlay his infinity diagram (here) on top of this as the processes are continuous. On the left is the outside world, on the right is the inside world. If you get the stuff on the right working, then the stuff on the left is positive and good. Conversely, well, I probably do not even need to say it. Each side is a closed loop in its own right, but connected to the other side – a continuum of sorts. A note on overused words. I have many words listed within the diagram many are over used within industry publications, blogs and articles on social media. often they are not only misused but only industry insiders are the only ones who care about them and pick them apart. There is a need, however, to be clear when they add value. For example, I put in there the word ‘engagement’. I am actually not a big fan of the word, but it makes sense in this context because it says ‘one person interacting with another in a way to adds the intent, context and a personal touch’. If Engagement is used to describe the activities on the left side, I think that is where it is misused. Yes, I know a presenter or Marketeer wants to engage their audience, elicit a response…another day. What do you think, am I close? There has been a tremendous amount great conversation during the past couple weeks, regarding Social CRM. What it is as well as what it is not. I am not sure we have reached any conclusions yet, but we have all become smarter for the insights of a great many individuals. Interestingly, I am usually a bit opinionated, but I sat on the sidelines, just observing – for the most part. As my title suggests, I do believe that we are all (customers, businesses, implementors and vendors) on a journey. As a group, we are working (struggling) to compartmentalize, as that seems to be human nature. We are treating the landscape as binary, you either have it, or your don’t. You will get there, or you will not. The economy is evolving, business is evolving, customers needs are evolving, so as all the components go through this evolution, yet, we are suggesting this needs to be a revolution, why? Very few of us subscribe to waterfall development methodology, therefore, we should be able to iterate through this as well, no? The difference, among my peers, who are having the conversation, do not seem to be as much about where we are going (ok, first chance for a comment), rather how we get there. We all want very similar things. As Graham reminded us all today, in quoting Peter Drucker on his post (which is a must read). The end game is already defined for us. When I sent a tweet out similar to my title, Graham responded “Indeed. Social CRM is a journey with a drunken man staggering around without a map at the moment.” Prem suggested something akin to Brownian motion or random walk (which brings back horrible memories of my graduate work with stochastic processes) I am not sure quite sure it is that bad, but maybe it is …. I like to build metaphor’s, and 4 out of 5 times they make sense to someone other than myself, but I will give it a shot anyway. If SocialCRM is the destination, then what is the vehicle to get us there? Is it strategy, or technology? Answer: It is both. It is the proper introduction and combination of technology, in support of the evolving processes, created by the empowered customer. Like the business trips we all take – trains, planes and automobiles – each client requires a slightly different itinerary. Exactly, each client requires a slightly different approach. So, a slightly different take from John, regarding ‘will it be built’. The landscape is not static, the journey will most certainly require mid-course corrections. So, we will build it. The question might be, will it ever be ‘done’?